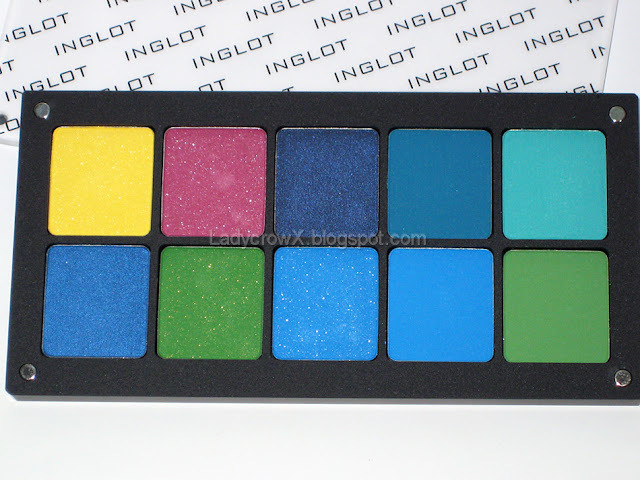 So I'm sure that most everyone has heard about Inglot, there aren't many gurus who haven't blogged or youtubed about them. 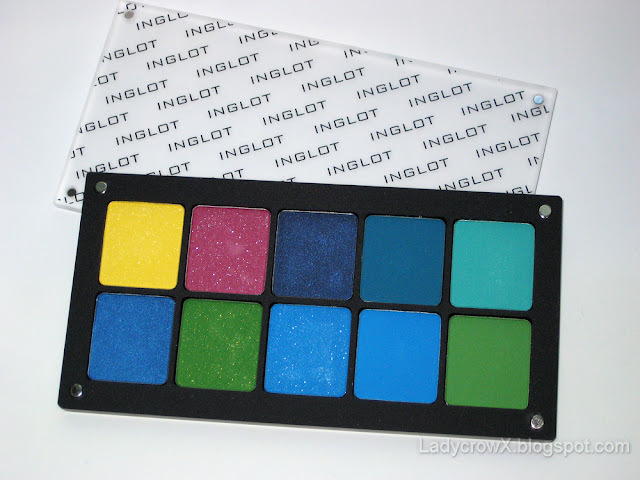 I have been waiting to make an Inglot purchase for months and I finally got the chance to do so thanks to my parents who gave me some birthday money to spend. It was tough narrowing down what I wanted to get as they have a ton of selection from every aspect of the rainbow. I don't own a lot of matte shadows so I really wanted to get those. Although once I ordered I found I only got 4 out of the 10 in matte finish. 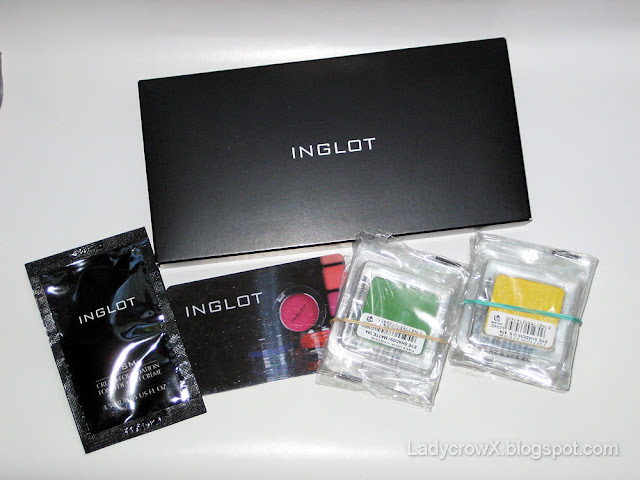 I was torn because I wanted to try some of the gel liners, lipsticks, blushes... well pretty much everything. Unfortunately right now funds are tight and I don't foresee getting a chance to do another order anytime in the near future so I had to go with eye-shadows because those are what I use the most. 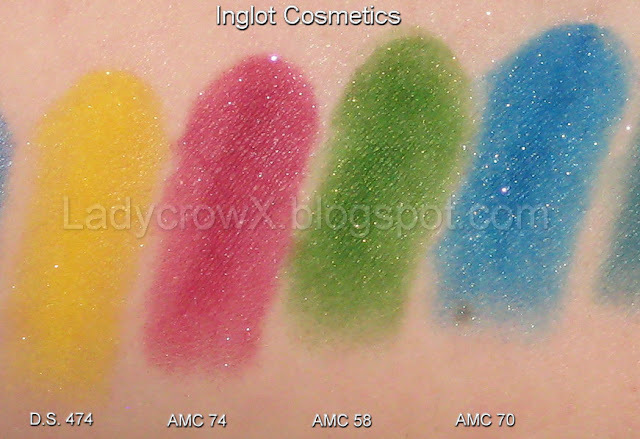 I own a ton of MAC gel liners as is although I am curious because people are saying they are as good if not better. It came in the standard shipping box with the company logo printed on it. Everything neatly bubble wrapped inside. 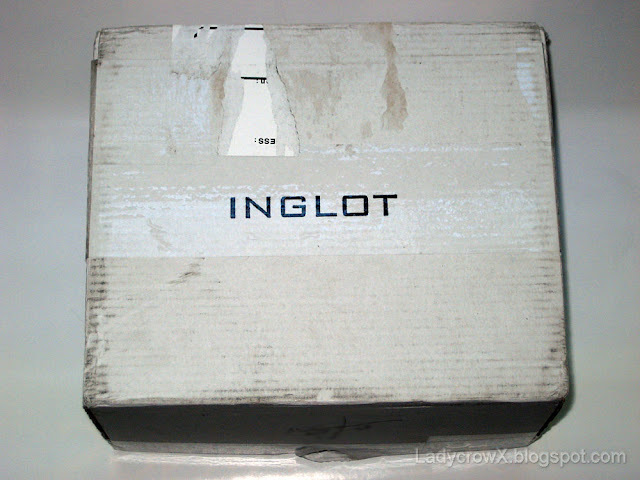 Included with my order was a sample of the Inglot Cream Foundation. 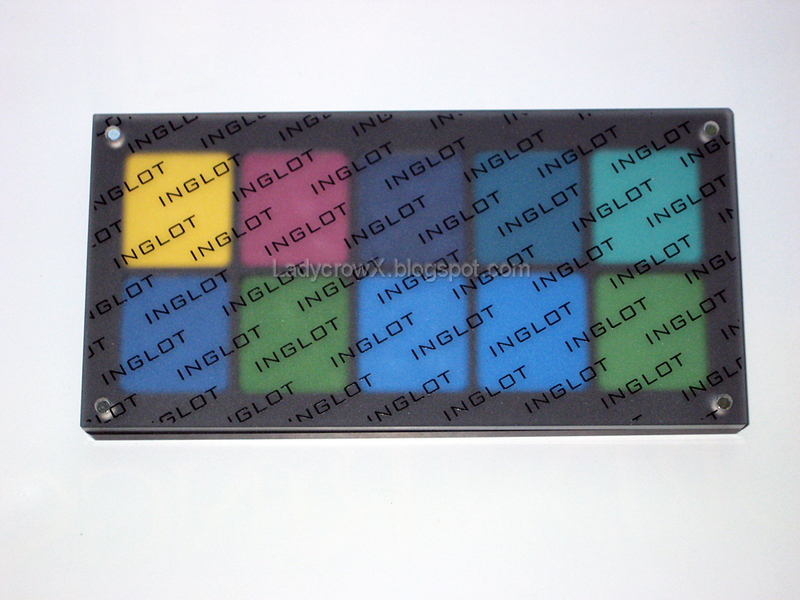 The palette is very sturdy and slightly weighted, the lid is held on by magnets. 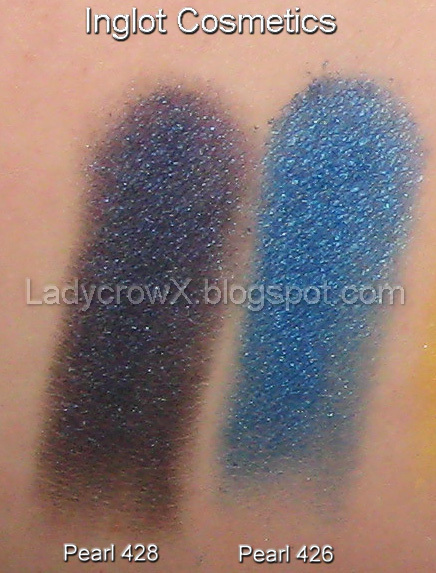 Swatched over Fyrinnae Pixie Epoxy. 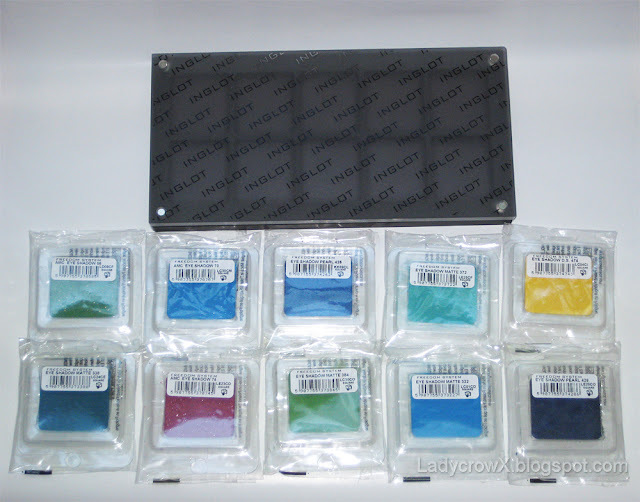 Price: $5.00 for the freedom system square shadows 2.3g - 2.7g , $7.00 for the freedom system square rainbow shadows. Freedom system empty 10 palette $10.00. Pros: The shadows are very pigmented, there's a wide range of colors, the price is reasonable, and you get a good amount of product. I do like the sturdiness of the palettes and the way the lid stays on tightly. I do like the fact I can see through the lid enough to see what shades I have. The customer service was polite when I spoke with them to order. The shipping was quick, I ordered by phone 08/15/11 and I received them by 08/18/11 (note: they were sent Fedex so other shipping may take longer). Cons: The website has no description of the colors. The shadows are difficult to get out of the palette due to the magnets being strong and it's easy to dent the shadows if not done carefully. People show that you are supposed to be able to use the lid magnets to remove the shadows but mine doesn't work and I tried all four corner magnets and even flipped the lid. 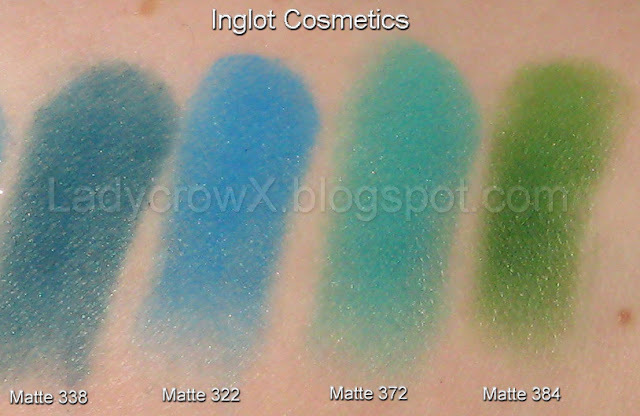 Some shadows look like they are swatched even when new (I think this is because the top of the plastic packaging presses against the actual shadow during shipping, not a big deal though as long as it doesn't damage the shadows). Would I order again: Definitely Yes! Regardless of the packaging (although it would be nice if they made some kind of tab or something for easy removal or even an extra magnetic piece that would allow for easily removal) I find the products to be on par with MAC shadows. Do you any Inglot? What's your favorite product(s)? Wow, the e/s colors are so pretty! I have 2 palettes and one lid of one palette works to pop the shadows out and the other lid doesn't! I might try with my fridge magnets - don't try to get then out with a knife or you'll probably make a hole like I did. Anyway... you picked beautiful colours! HA, you got bubble wrap around your stuff... at least they're improving! Anyway, love what you choose and can't wait to see FOTDs. 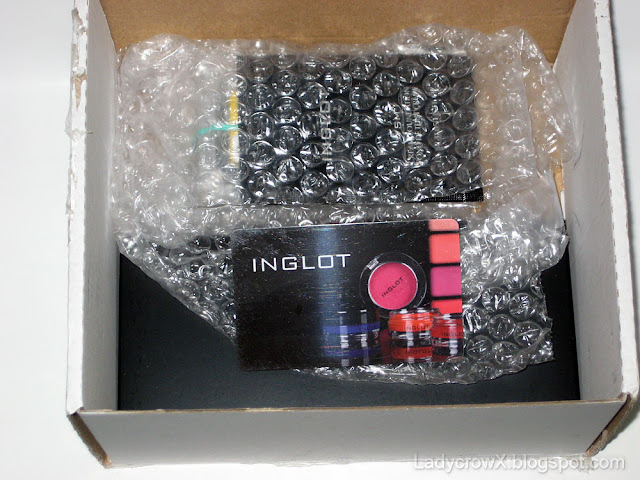 I personally love Inglot cosmetics. They are affordable and good quality..